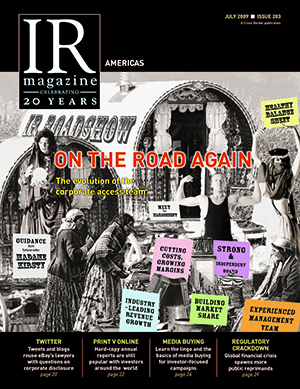 Almost a decade has passed since Clare Harrison wrote the cover story for the July 2009 issue of IR Magazine. Titled On the road again, she looked at the evolution of the corporate access team – a change we continue to watch today. And while Harrison noted a shift away from schedules packed with high-paying hedge funds as both the number of funds and their spending power dwindled, that didn’t necessarily mean companies were less willing to meet with them. Since then, a number of institutions have come out with ‘no feedback’ policies (as far as brokers are concerned) – a hole the new breed of corporate access platforms have attempted to fill. But even in 2009, Michael Sullivan, corporate vice president of investor relations at Applied Materials, pointed to this growing trend. A third area of focus for Harrison was investor events, which were also feeling the effects of the credit crunch. ‘In addition to the staff changes, there have been implications for the nature of the events put on for companies and their investors. Low-key conferences and so-called reverse roadshows – where a single investor meets a series of companies – are in vogue, while the larger and flashier investment conferences of old take a back seat,’ she wrote. All the trends noted in 2009 as a result of the financial crisis continue to be talked about in the conversation around Mifid II: the sell side is shrinking, coverage is expected to fall (even if we continue to hear that it’s still ‘business as usual’) and IROs are expected to be taking on a lot more of the targeting and corporate access work performed by brokers in the past. Nick Arbuthnott, former managing director of European research at Ipreo, pointed out at last year’s Global IR Forum in Paris that the slimming down of the sell side is part of a long-term trend – something Harrison’s 2009 cover story also serves to remind us. But using information from the World Bank, IR Magazine and its own data, Ipreo predicts a rise in demand for events heading into 2020, with access to management becoming increasingly important for many investors – especially at small and mid-cap companies, where management might be less well known and where there’s a perception that there’s less publicly available information out there. At the same time, Ipreo forecasts the number of meetings facilitated by the sell side to fall from around 85 percent in 2016 to less than 30 percent in 2020 as a result of Mifid II. At the IR Magazine Think Tank – Europe 2018 (when Mifid II had been in force for more than six months), IROs were already beginning to notice a greater burden of direct contact from the buy side and the occasional hole in the roadshow schedule. But while there are expectations of extra workload, a number of people see a positive in the changes being brought about by the mammoth regulation. They predict that in a survival of the fittest situation in relation to research, companies will eventually find themselves with better quality coverage and higher levels of satisfaction. The evolution of the sell side, it seems, is not quite over.